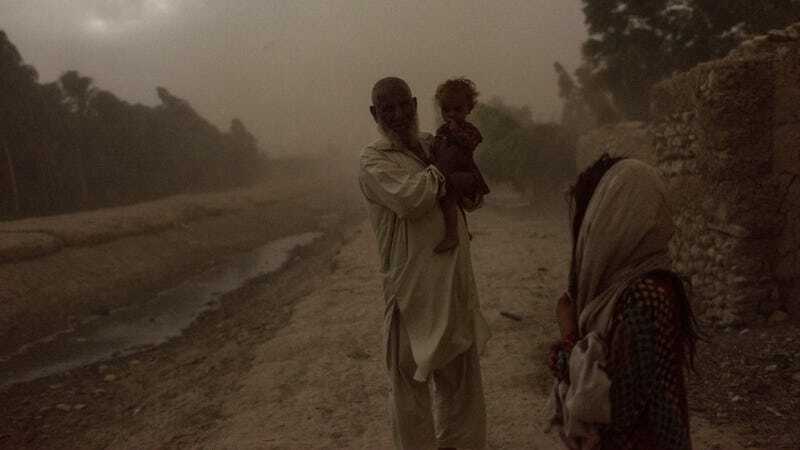 A man and children who were displaced by Islamic State of Iraq and Syria - Khorasan (ISKP) stand outside their current home during a storm on July 14, 2017, in Surkh Rod District, Afghanistan. Satellite images reveal extensive mining operations not far from the site of a 2017 US airstrike in the Nangarhar Province of Afghanistan—an attack most Americans remember only because of the nightmarish nickname of the weapon employed: The “Mother of All Bombs.” The 20,000-pound GBU-43/B Massive Ordnance Air Blast, or MOAB, was detonated above a massive tunnel complex as a group of suspected insurgents reportedly hid within. According to an exhaustive report published Tuesday by Global Witness, an international conflict watchdog, the Islamic State in Afghanistan (ISKP) and the Taliban are presently battling for control of the country’s rich mineral resources in the Nangarhar province, with local communities caught in the crossfire. The report, titled, “At Any Price, We Will Take the Mines,” details how Afghan conflict minerals such as talc are mined by armed groups, including the Islamic State; delivered to Pakistan for exportation; and eventually find their way into consumer products sold in Western nations—predominately, the United States. Talc, talcum, or soapstone, aka “baby powder,” is used in a wide variety of products, including cosmetics and oil-based paints. You can find it in dried foods and bubble gum. It’s used in papermaking and recycling; in pharmaceuticals and the production of rubber, ceramics, and olive oil. It’s found inside electrical cords, roofing material, floor tiles, as a lubricant, as a brightening agent, as a filler. LeBron James used to toss it in the air as part of a pre-game ritual. It may even be on you right now. More than 35 percent of the talc imported from the US comes from Pakistan, though it’s no secret where most of it originates. “Large quantities of crude talc are mined in Afghanistan before being milled in and exported from Pakistan,” notes a January 2017 U.S. Geological Survey report. According to Global Witness, a vast amount of the talc extracted by armed groups from Afghan mountains is exported to the United States by way of Pakistan, and a majority of the minerals are transported by truck through government-held territory. The border crossing at Torkham, which has a considerable military presence on both sides and is used by U.S.-led NATO forces to import supplies into landlocked Afghanistan, is reportedly a primary passage. Peshawar, which sits along the entrance to the Khyber Pass—a historic Silk Road route—is a top destination for the trucks. The Taliban alone is estimated to rake in roughly $300 million a year from the minerals mined in Afghanistan, including talc, though it’s difficult to say what percentage finds its way into Western markets. “Of the revenue that’s coming from Afghan talc, you can say that a significant portion is ultimately coming from US and European consumers,” said Nick Donovan, campaign director at Global Witness. Pinpointing which specific companies are using particular shipments that ultimately benefited armed groups, however, is virtually impossible. The transport of minerals to Pakistan by insurgents is “closely linked to and enabled by corruption of Afghan government officials, as well as the payments to insurgents,” Global Witness says. This manifests in the form of fraudulent documents obtained from customs officials and bribes paid at weigh stations along the route. Reportedly, passage into Pakistan may be ensured for no more than 10,000 Pakistani rupees (around $90). Global Witness’s sources, whose names the group withheld out of concern of retaliation against them, likened the trade to a “mafia system,” wherein the illegal extraction is protected by provincial authorities often with the support of the people, both of whom can benefit financially from the arrangement. The minerals extracted from mines controlled by the Taliban and Islamic State militants almost all end up on the international market, from Italy to Australia and China, the report found. Pakistan remains America’s largest single source of talc, and Global Witness estimates that at least 20 percent of those exports likely benefit armed groups. In a 2016 report, Global Witness identified lapis luzuli, a blue stone found almost exclusively in Afghanistan’s Kokcha River valley, as a “conflict mineral,” a term denoting extracted natural resources in war zones, profits from which fuel human rights abuses, perpetuate destruction and death, and are in some cases obtained through slave labour. The comparison to other more well-known conflict resources, including so-called “blood diamonds,” which have been mined to finance warlord activity in several African countries, such as Angola and Sierra Leone, is a fair one, says Donovan. The report paints U.S. military intervention in particular as a disastrous recourse, as there would be little to no local support for American companies or NATO forces that attempted, in colonialist fashion, to seize control of the mines. Rather, it recommends empowering local communities by giving them a stake in legal mining operations. It freely admits, however, a number of acutely distressing challenges: These communities could never stand up to Islamic State forces, and other tribal and social conflicts in the region make cooperation difficult to achieve. “Three key elements are needed: a viable channel for fair redistribution; transparency and monitoring at a local level; and in some cases community ownership or legalized artisanal production,” the report says. As for the Afghanistan government, blocking the transfer of minerals mined by armed groups is a recommended first step. But while its important that the government generate revenue, the report says, the communities themselves should own and operate the mines—not Western corporations. Last year, President Trump, reportedly prodded by President Ashraf Ghani of Afghanistan, had considered the nation’s vast mineral wealth as a reason to continue the war, which is now in its 16th year. “To the victor belong the spoils,” he said. Motivations aside, some of Trump’s top advisers and close associates only stand to profit from continued U.S. military involvement in the region; namely, Stephen Feinberg, the CEO of Cerberus Capital, which owns DynCorp, a major military contractor; and Erik Prince, the founder of Blackwater and brother of Education Secretary Betsy DeVos, who is close to the Trump family and has proposed plans to privatize the war by embedding U.S. mercenaries within the Afghan National Security Forces.